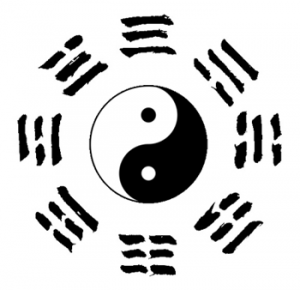 Based on the Tai Chi symbol, trigrams are a universal symbol of natural balance and formed the foundations of Chinese philosophy, the I Ching and Feng Shui. These ancient symbols, first discovered by Fu Xi in 3300 BCE, contain great wisdom and incredibly advanced knowledge. Individually, they teach us about important phenomena that affect life; collectively, they describe how nature works and show us how to live a naturally balanced life. The eight trigrams can be arranged in two ways: Early Heaven (前天) or Later Heaven (后天). The Early Heaven is the unconditioned, celestial state, distinguished by oneness and true consciousness, when the Original Spirit is present, and the Later Heaven is the conditioned, human state, distinguished by multiplicty and discriminating concsiousness. The trigrams Heaven ☰, Earth ☷, Fire ☲, and Water ☵ have multiple meanings. Understanding them is not simply a matter of gathering knowledge about them, but also requires that one sees their operation in oneself.